Santa Rosa Rep. Lynn Woolsey visits with (from left) T/Sgt. Shiro Nakano (MIS), Pfc Minobu Furuta (442nd), Capt. Frank Masuoka (MIS), and S/Sgt. Ted Ito (442nd). 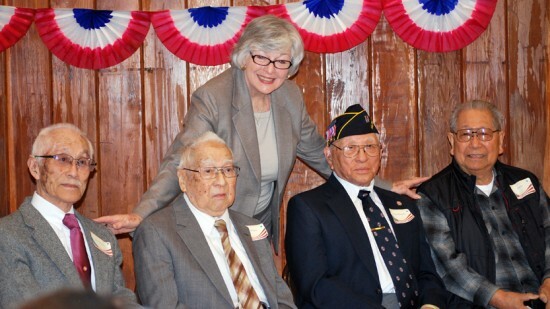 SEBASTOPOL, Calif. — Twenty-five Sonoma County Nisei veterans were honored at a Congressional Gold Medal ceremony on April 14. The ceremony was hosted by the Sonoma County Japanese American Citizens League. About 250 people gathered at Memorial Hall at Enmanji Buddhist Temple in Sebastopol to celebrate the extraordinary service and sacrifice of these veterans. Among the guests were U.S. Rep. Lynn Woolsey (D-Santa Rosa), Sonoma County Supervisor Efren Carrillo, Sebastopol Mayor Guy Wilson, Santa Rosa Mayor Ernesto Olivares, and former Sebastopol Mayor Larry Robinson. Four of the five living awardees from Sonoma County — 442nd veterans Minobu Furuta and Ted Ito and MIS veterans Shiro Nakano and Frank Masuoka — were able to receive this honor in person while the families and community members gave them a standing ovation. Woolsey presented a bronze medallion to each recipient or to his surviving relative, with words of appreciation and admiration that were echoed by all attendees. Mark Hayashi, a JACL board member and the emcee of the ceremony, read messages from Sen. Daniel Inouye (D-Hawaii) and local historian Gaye LeBaron celebrating this historic event. The Congressional Gold Medal, the nation’s highest civilian award, was approved by Congress and President Obama in October 2010 to be bestowed collectively on the U.S. Army’s 100th Infantry Battalion, 442nd Regimental Combat Team, and Military Intelligence Service. In November 2011, a medal presentation was held in Washington, D.C. with congressional leaders from both parties participating. Many regions across the U.S. have been organizing events to honor their local recipients, many of whom were unable to attend last year’s ceremony. Organized in August 1934, the Sonoma County JACL is dedicated to educating the public about the Japanese American experience, monitoring legislation affecting minority human and civil rights, and fostering Japanese American culture. Visit the Sonoma County JACL website for more information.